With its soaring red sandstone cliffs, signature buttes, towering monoliths, gravity-defying natural arches, and narrow slot canyons, Zion National Park offers visitors spectacular sights to explore in all directions. Utah’s first national park marks the geographic intersection of the Colorado Plateau, the Great Basin, and the Mojave Desert regions, which creates a unique environment that’s known for its diversity of plants and animals. It is impossible to tick off all the must-see sights and must-do activities in the park and surrounding area in just one day. Three days is the bare minimum, a week is better, a lifetime is almost enough. Located just outside the park, the town of Springdale, Utah, serves as the basecamp for most people visiting the park and can provide any and all needs. You’ll find guides for all sorts of adventures from slot canyoneering, climbing, even paddleboarding and helicopter tours. 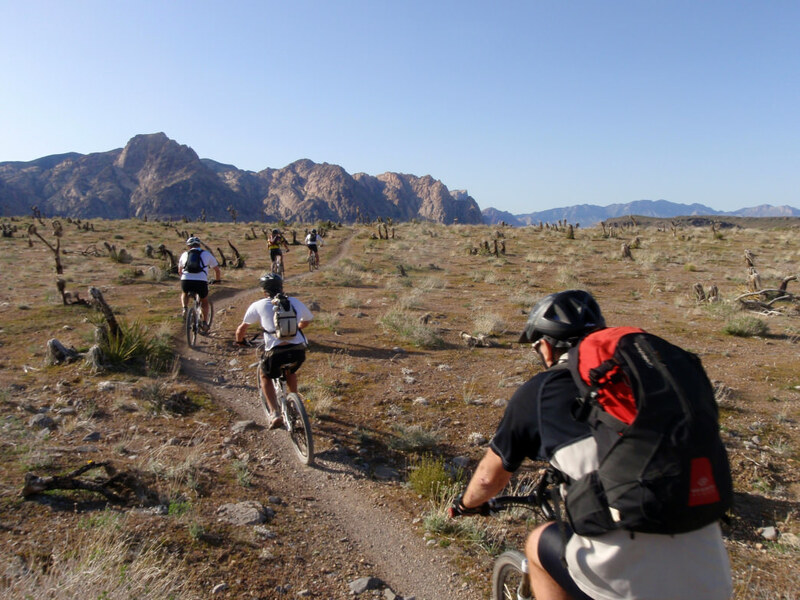 You can rent bikes and other outdoor equipment or fill your backpack with everything you’d need for a trek. But it would be a shame to discount this charming desert oasis as just a spot to refuel and outfit your trip: You’ll also find galleries featuring local artists and photographers—just one way to bring a memento of Zion home with you. A free shuttle service was created in 2000 to eliminate traffic congestion and restore the tranquility of Zion Canyon. The shuttles travel an out-and-back route on Zion Canyon Scenic Drive, which is closed to other motorized vehicles. Hop on the shuttle at the Visitors Center and take it to one of nine stops along the route, giving you access to the park’s major attractions. (Another free shuttle from Springdale will take you into the park). Shuttles arrive at each stop every 7-10 minutes, so you never have to wait long. The shuttle ride alone offers an incredible view of Zion Canyon, allowing you to get your bearings before heading off on your adventure. One final drive that everyone should make: The 12-mile Zion-Mount Carmel Highway runs through the park from the south to east entrances, and it rivals the Zion Canyon Scenic Drive in beauty. It rises above the canyon, providing dramatic—and different—views of the valley. A narrow 1.1-mile tunnel is another highlight. Just beyond the tunnel on the east side, the Canyon Overlook Trail is a short (1 mile round-trip) route that shouldn’t be missed. There’s so much to see—and you haven’t even gotten out of the vehicles yet. Here are just some additional highlights that make this national park a multi-day experience. 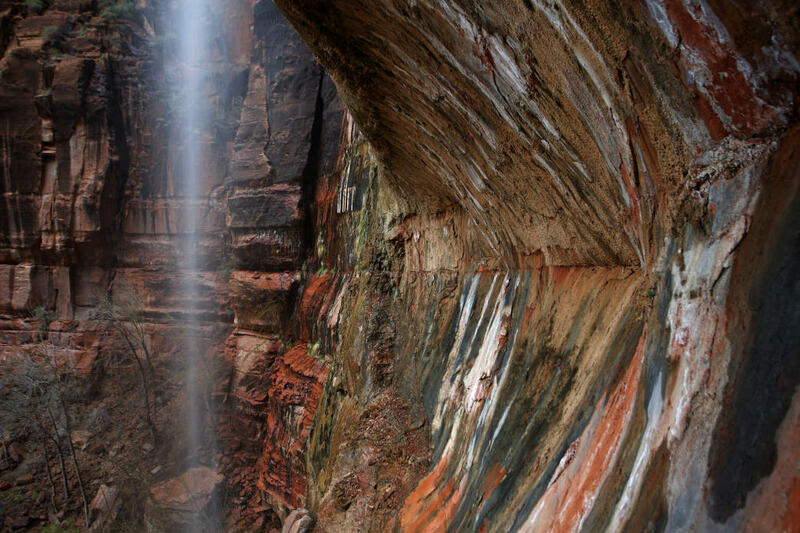 Discover the hanging gardens and tiny waterfalls at Weeping Rock. With more than 90 miles of trails across its 124,400 acres of designated wilderness, Zion is truly a hiker’s park with both iconic hikes or more off-the-beaten-path experiences. Angel’s Landing and the Narrows are two of the park’s signature hikes, with the crowds that go along with the notoriety. But it doesn’t take much work to find equally interesting hiking trails in the park. If you’re looking for solitude, check out the Coalpits Trail. It’s a long day or an easy overnight trip that follows the sandy banks of a serene desert wash. This little-traveled corner of the park is surprisingly lush with giant cottonwood trees, stunted sagebrush, and colorful wildflowers. • Weeping Rock, an overhang with running water (usually dripping, sometimes more) that offers an up-close view of hanging gardens clinging to the cliff wall. The Lower Emerald Pools are another weeping wall, but with a pool at the base. Emerald Pools is a good family hike that starts just across from the Zion Lodge and features a number of shorter trails to explore. • Another more accessible option for families is The Watchman Trail, which starts by the Visitors Center and takes hikers about 300 feet up for a nice view of surrounding park. • The 2.2-mile (round-trip) Riverside Walk is a paved trail along the Virgin River that’s accessible at the last stop on the shuttle bus. Depending on the season, you may find large waterfalls running over cliff walls and hanging gardens. • For a more strenuous hike, start at the Weeping Rock Trailhead and head to Observation Point, a classic Zion route. This 8-mile (round-trip) hike is challenging, with lots of climbing on hard trail hugging the canyon walls. Along the way you’ll see Echo Canyon and the White Cliffs, before reaching the aptly named Observation Point, with one of the park’s signature views. 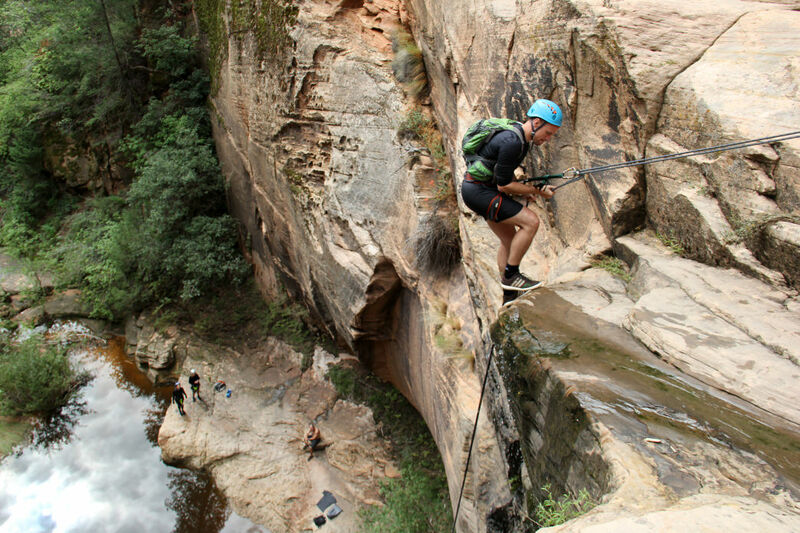 • Hidden Canyon is a great place for hikers to take their first steps toward canyoneering. You won’t need any climbing or rappelling skills, but you still get to explore a narrow canyon that’s separated—or “hidden”—from the main canyon. Once again, start at the Weeping Rock Trailhead and follow the trail to Observation Point, but take the detour to Hidden Canyon instead. Expect to climb more than 1,000 feet and do some scrambling along the way. • The La Verkin Creek Trail is route that takes hikers from Lee Pass go Kolob Arch (7 miles) before continuing on to the Hop Valley Trailhead (another 7.4 miles). You’ll follow Timber Creek at the start, before descending down a slope to a view of La Verkin Creek, which you’ll follow upstream. You’ll see amazing views of the cliffs as well as, eventually, Kolob Arch, thought to be the largest free standing arch in the world. • From the less-crowded east entrance, see the Checkerboard Mesa, an unusually white-colored mesa with a checkerboard pattern. You can find several hiking options around here to further explore the mesa and region. Gooseberry Mesa has world-class riding that rivals the more-famous Moab. While the Zion Canyon Scenic Drive is closed to motor vehicles outside of the shuttles, it’s open to cyclists. The out-and-back route passes all the canyon’s major landmarks while climbing about 1,200 feet over 17 miles. Riders can enjoy the scenery without noise or danger. (Note that buses will not pass cyclists, so riders should pull over and let them pass.) The shuttles have racks for two bikes. Hitch a ride to the Temple of Sinawava stop and enjoy the ride back—it’s almost all downhill. Mountain biking is prohibited in the park proper. But that’s OK, Gooseberry Mesa has world-class riding that rivals the more-famous Moab. Gooseberry’s 30 miles of trail deliver fun, techy riding and limitless views. In Virgin, Utah, check out the Guacamole Trail. It’s a little easier terrain than in Gooseberry with postcard-worthy views of the backsides of West Temple and Mount Kinesava. It’s 11 miles of smile-inducing singletrack and slickrock. Look up to see owls, hawks, and even condor. Between Hurricane and La Verkin, there sits an IMBA Epic called the J.E.M./Hurricane Rim/Gould loop. It’s 25 miles of swoopy, fast, and sculpted singletrack. A highlight is the climb to the overlook the above the Virgin River. Climbers the world over come to Zion to scale the user-friendly big walls. Classics like Spaceshot, Northeast Buttress, Moonlight Buttress, and Prodigal Sun are iconic aid routes. Monkeyfinger and Iron Messiah are long free routes that are stellar. The Namaste Wall and Mountain Of the Sun are perfect if looking for a day of cragging on shorter trad routes or bolted sport climbs. Routes like the Subway are great for canyoneering. Rappelling down a narrow, curved passageway is unforgettable. The park has several classics for the adventurous involving long rappels, bracing swims, and climbs over rock formations. Routes like the Subway, Orderville, or Keyhole Canyon, and Pine Creek make Zion a Mecca for canyoneering. Springdale has several well-qualified outfitters that specialize in guiding visitors of all experience levels. Hungry travelers don’t want for good food here either. In Springdale, start with a hearty breakfast of a Mexican green chili omelet at Oscar’s Cafe. For lunch, check out the fried chicken tacos at the Barefoot Taqueria, which brings a refined and elevated experience to counter-style dining. The Spotted Dog Cafe specializes in free-range meats and local food like Rocky Mountain red trout or the wild game meatloaf. And no visit to Zion is complete without a dinner at Bistro H, well-known for its award-winning chef, Scott Lewis, who is known for his interesting menu with delicious paired offerings. It’s located at the Cliffrose and is scheduled to be open by the second week in June. The fun and adventure that awaits the intrepid visitor to this area of southwestern Utah is monumental. The views are so grand, the horizon so far, the formations so tall, it’s easy to get overwhelmed. In the glowing red canyons of Zion, slowing down means seeing more. Written by Shaine Smith for RootsRated Media in partnership with ZionNationalPark.com.